International child abductions in Japan in the thousands? This is a very rough approach, but we think it’s pretty close. 1. According to a widely cited 1990 U.S. Department of Justice study called “National Incidence Studies of Missing, Abducted, Runaway and Thrownaway Children,” 354,100 abductions per year are committed by family members in the U.S. Based on the 1990 U.S. population of 248,709,873, this works out to a U.S. per capita family abduction rate of 0.0014237. 2. Assuming that this per capita family abduction rate is about the same for the Japanese population, based on the July 2006 estimated population of 127,463,611, the total number of estimated abductions per year in Japan by family members works out to 181,470. Even if we are off by 20% or more in making this assumption, we will make a conservative adjustment further below that more than makes up for any possible error in this step. 3. Looking at recent periods, such as for example 2000-2003, 4.8% of all Japanese marriages involved a foreigner marrying a Japanese. Assuming the frequency of family abductions is about the same for Japanese married to Japanese as it is for Japanese married to foreigners, we can apply this 4.8% percentage to the estimated 181,470 family abductions in 2006, and can conclude that about 8,710 of the estimated family abductions in Japan involve an international marriage between a Japanese and a foreigner. 4. Although most of the international child abductions involving children in Japan seem to be committed by the Japanese parent, for the sake of argument we will assume that family abductions in Japan are done equally frequently by the foreign spouse as by the Japanese spouse. 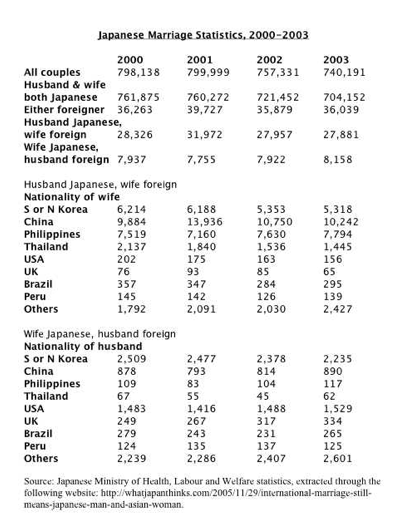 This would mean that half of the 8,710 estimated international marriage family abduction cases, or approximately 4,305 cases, involve children of international marriages abducted to or retained in Japan by the Japanese spouse. 5. With U.S. citizens accounting for about 4.5% of the international couples, 194 of the estimated 4,305 cases would involve U.S. children being abducted to or retained in Japan. 6. To provide for a very conservative margin of error, and adjust for the assumptions in step 2 above and other assumptions we have made, we will reduce our estimates from above by 50%. Even so, this would mean that there are more than 2,000 international cases PER YEAR of children of international marriages being abducted to or retained in Japan, with almost 100 cases PER YEAR involving U.S. children. Cummulatively, adding together all the cases for the past 5 or more years, the total easily could be more than 10,000 international cases and over 500 cases involving U.S. children. Most cases, especially those where the foreign parent resides in Japan, never get reported to the U.S. State Department or other agencies in Japan or other countries. These numbers are very hard to determine without using an estimation process as above since there are no missing children organizations or official records about abducted/missing children in Japan. HR1326 passes House 416 to 1! A major victory for left-behind American parents with children abducted to or retained in Japan! The only dissenting vote was from Representative Ron Paul of Texas. The video archive page has a 10 hour video on it. To get to the part about HR1326 you can slide the dot on the bar over to the right about 25% of the way from the beginning and look for the time clock on the video that says “live” above it , and watch for the Pacific Time number to say 12:24 PM (or the Eastern Time number to say 3:24 PM). Foreign Relations Committee Chairman Howard Berman introduces the Resolution at about 12:24 PT on that clock. This case is not unique and reflects the reality in Japan as far as parental child abduction is concerned. Japan Times, thank you for publishing this. US House Resolution 1326, condemning the abduction of hundreds of American children to Japan, and introduced on May 5, 2010 by Congressman Jim Moran, will come to the Floor of the House of Representatives this week for a vote. This just came out in the Japan Times, part 1 of a two part series about how various Japanese government agencies are involved in supporting child abduction in Japan and keeping children against their will from seeing their other parent. At a town hall meeting about international parental child abduction to Japan held on September 17 in Washington, D.C., Assistant Secretary of State for Consular Affairs Janice L. Jacobs announced the latest statistics for the number of cases involving child abductions to Japan. From 1994 to June 30, 2010 214 cases involving 300 children were opened with the U.S. State Department. Currently there are 95 active cases involving 134 children. These statistics are higher than statistics previously released by the State Department. Assistant Secretary of State for East Asian and Pacific Affairs Dr. Kurt M. Campbell also announced at the meeting that the international child abduction issue would be brought up by President Obama at a scheduled bilateral meeting with Japanese Prime Minister Naoto Kan in New York on September 23, when President Obama will be speaking before the United Nations General Assembly. The town hall meeting was the fourth such meeting held in Washington within the last 12 months and was attended by approximately two dozen left-behind parents with active child abduction cases involving children being held in Japan.